I rarely meet a business or technology executive who is satisfied with the effectiveness and efficiency of IT processes and activities. Common complains are response time, things falling in the cracks, under estimating, incomplete solutions….etc. Complains usually come with complete despair! we tried multiple processes, best practices….etc but nothing works! When I speak to IT Managers, the despair comes in a different flavor! they will never understand how IT works! the don’t appreciate our effort, and they don’t give us enough support. I agree with the later! However, I believe if IT managers do the following, – and I have experienced that my self -. Things will work and IT processes will improve. First no improvement what so ever should start without having a baseline that states “Where are we now?”. That is important so that improvement is really measured and not based on the gut feeling of business managers and executives!. To be able to define baseline a measurement framework should be in place to give an insight about the current situation. Then, a plan is set and the wheel starts rolling. Measurements are again very important to keep measuring against the targets. Frequent communication and reporting is vital to compare the progress against the base line e.g. Average time to resolve any request was 8 days, now we’re at 4 hours. Goal Achieved? great. Let’s set another goal and keep the wheel rolling. 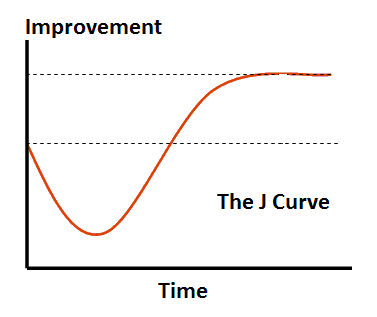 Improvement is iterative, It might not make positive results from the first cycle, many cycle might take place before the ultimate situation is reached – which might not last for more than few months, if not weeks! One final comment, I advise not to start any improvement before having measurement framework in place. IT managers, believe me you’ve to fight for this, else it will fail and you’ll be blamed for that! « What to change? How to change? or, Why to change?